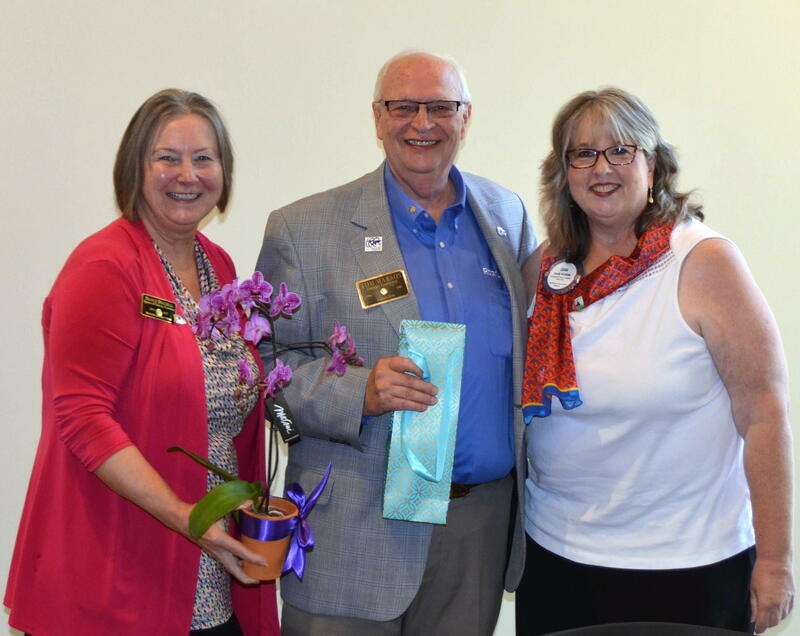 New District Governor Tom Markos and his wife, Nancy, paid our club a visit last Wednesday. Our District has something like 74 clubs, and Tom plans to get around to all of them in the coming year. Tom’s passion is the Rotary Foundation, which will mark its 100th anniversary in 2017. He gave a number of moving examples and stories of all the good our donations do. For example, a $5 donation, when matched by the Foundation, will buy 3 dictionaries to give to children who may never have owned a book before. Or, it could buy a vial of vaccine and help ensure that 10 kids will not get polio. Tom stressed that we should all be proud to wear the Rotary pin. Rotary has helped so many around the world through its projects and Foundation grants, and it promotes worldwide friendships and business connections. 2017 will also mark the anniversary of 30 years of women having membership opportunities in Rotary. Currently, 15% of members worldwide are women; 22% in North America and 32% in our District. He also announced that next year’s District Conference will be Memorial Day weekend (May 26 – 28) in Seaside. 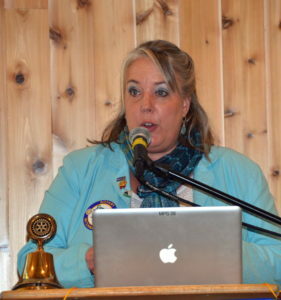 The keynote speaker will be Sylvia Whitlock, a woman who was instrumental in getting the rules changed to permit women to join Rotary. Best to book right now while hotel rooms and discounts are available. TUESDAY: Rotary is sponsoring Tunes on Tuesday tomorrow. Come on out and show your support. 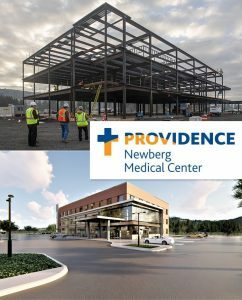 Chehalem Cultural Center from 6:30 to 8:30pm. Gates open at 5:30pm. WEDNESDAY: We will learn about the history of our Club, presented by our summer intern, Britta Stewart. 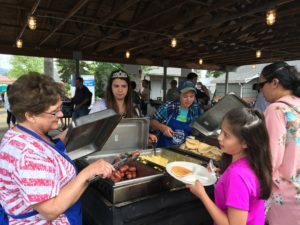 NEXT WEEKEND: Annual pancake breakfast time! Please sign up to help if you haven’t already. Some people, who will go unnamed, like Jim McMaster and Auggie Gonzales, can’t join us this year because they will either be on a water polo cruise in Croatia or at a family reunion. They’ll be missed. Aaaaaaaaahhhh….summer. Time for the county fair! Gotta love looking at all those pigs, rabbits and sheep, and checking out the blue-ribbon pies and jams. 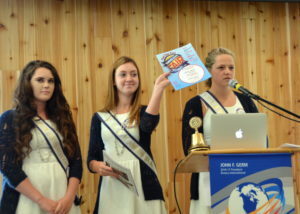 At Wednesday’s meeting, we learned all about the plans for this year’s Yamhill County Fair from Erin Rush, Courtney Croft and Samantha Roff, the 2016 Fair and Rodeo Ambassadors. By becoming an Ambassador, each young lady received a $1000 scholarship. Erin graduated from Yamhill Carlton High School and will attend Linfield this Fall. She wants to pursue a degree in medicine. Samantha graduated from Newberg High School, will attend Oregon State and wants to be a vet. Courtney also graduated from NHS and plans to attend Eastern Oregon University. She aspires to be an agricultural risk management consultant. President Leah Griffith handed out some awards last week: to Paul Jellum for 30 years of membership (that’s 3-0, THIRTY! Way to go, Paul! ), and to Denise Bacon for perfect attendance. She also shared information on the possibility of moving our meeting location to the Chehalem Cultural Center. If you have any opinions on this, please talk to Leah or any board member. A decision will need to be reached before George Fox students return for the Fall. Tunes on Tuesday has started, so come on down, have a glass of wine and help out with our booth. And lastly, please don’t miss this Wednesday’s meeting. Our new District Governor, Tom Markos, will join us. The annual Changing of the Guard. That’s what it was at last Wednesday’s luncheon. New President Leah Griffith called her first official meeting to order, and shared information about the convention she attended in Korea and her plans for the year ahead. Heads up! Leah plans to change things up a bit—starting with the process we use at the beginning of each meeting. We’ll still do the Pledge of Allegiance and a reflection. But then we’ll have “My Rotary Moment,” where you can talk about a special time or event in your Rotary service. Then guests will be introduced, followed by non-revenue-generating announcements. At the end of the intro process, the Duck will be passed around (third week of the month will still be dedicated to Polio Plus fundraising). 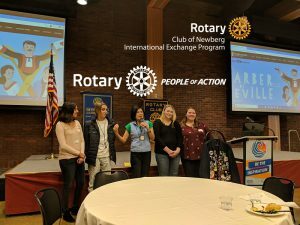 Christmas tree lighting—maybe more Rotary involvement? Our meeting guests included Intern Britta Stewart and prospective members Julie Robinson and Matt Stephens. Walter Want introduced their guests, his sister and brother-in-law, Sissy and Richard Riley, from Gilbert, Arizona, who traveled here to help Walter and Julie celebrate their 50th wedding anniversary. Auggie introduced visiting Rotarians Tom and Alma Olson– key figures in support of our Guatemala missions. 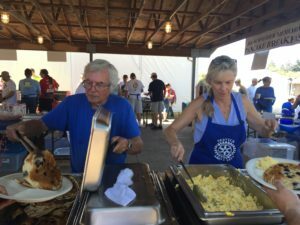 Both Tom and Alma are past presidents of the Antigua Rotary Club. New Club President Leah Griffith with visiting Rotarians from Guatemala, Tom and Alma Olson. Spike asked whether anyone is interested in serving a 3-year term on the club Foundation Board. If so, he would like to hear from you. Involves about 6 to 7 meetings a year. 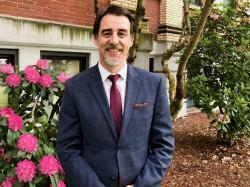 Todd moves into the Prez-elect position, with responsibility for programs. If you have an idea for a topic, please contact him. Scott becomes Prez-Prez-elect. Many thanks to Bob Ficker for his service and welcome to new treasurer Dawn. Before hitting the bell to adjourn, Leah also installed Mike Boock as our new membership chair and Rob Dailey as vocational service chair. Jim McMaster received a perfect attendance award, Walter a 15-years-of-service award and Leroy Benham a 40-years-of-service award. Wow, Leroy! Congratulations, all. And thanks to all club members who volunteered with Special Olympics this past weekend. Heard there were about a dozen at the bocce ball event, and there were about that many serving dinners, too. So nice. It was a busy last day for Prez Jim. We had so many guests I couldn’t keep them straight. 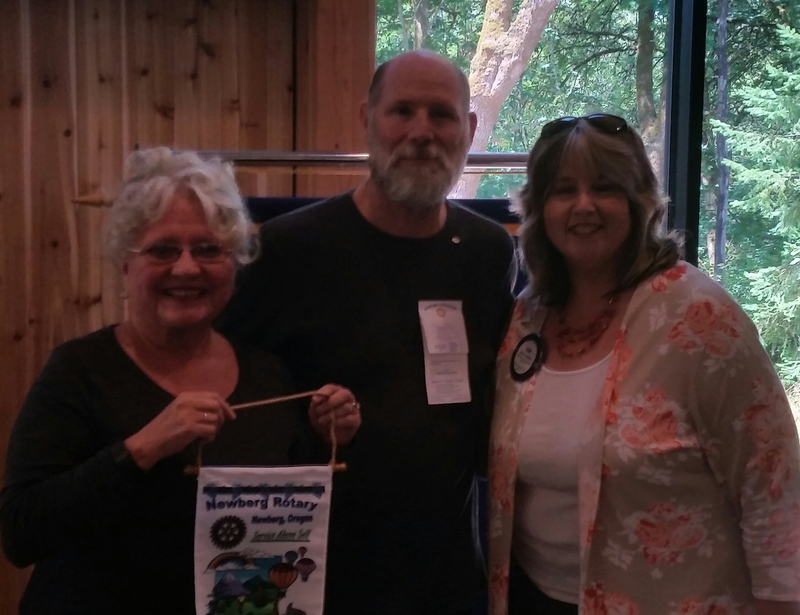 We had a couple of prospective members including Matt Stephens and Judy Robinson, and visiting Rotarian from Woodburn, Ty Burlingham. Our intern Britta Stewart was there and others that I missed. Sorry about that. We had our annual visit from the St. Paul Rodeo today and it w as fun and interesting with John Growney their stock contractor for 35 years who has great stories to share about the St. Paul Rodeo, the biggest 4th of July Rodeo in the country. It has over $500,000 in prizes for the cowboys. Growney brings in 10 semi trucks of livestock and some of the bulls and horses have their own reputation and following. We had lots of guests from the Rodeo including Mark and Betty Vergets (Ace Hardware), Russ Thomas, Tyler Thomas and Ann Dolan along with Rotarian Bill Dolan. 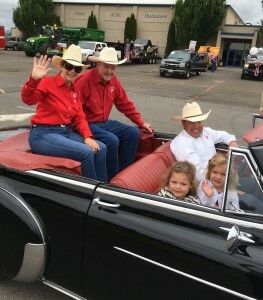 Bill is the grand marshall of this years parade for his 50 years serving the Rodeo. Good Job Bill. The Rodeo Queen Brianna Eby and princesses Tess Scott and Rebecca Lambert shared what it takes to be a rodeo princess which includes exceptional horsemanship, public speaking skills and the ability to handle your horse or even a substitute horse in stressful situations like parades. The St. Paul Rodeo volunteers were awarded the Volunteer Organization of the Year by the Chehalem Valley Chamber earlier this year. It was a great end to a great year for President Jim McMaster. Thanks Jim for your year of service. Next up is the Installation Banquet on June 30th.